This article is a translation of a previous post on The Postcolonialist. Translation provided by the author. 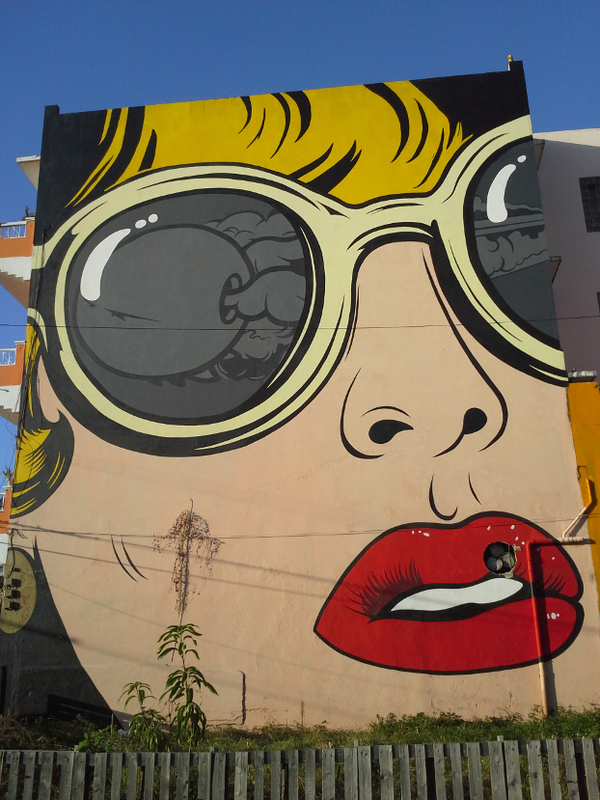 Santurce is an area that boasts a varied cultural and artistic scene. Formerly known as San Mateo de Cangrejos (St. Matthew of Crabs) and a municipality in its own right, it is now a barrio of San Juan, the capital city of Puerto Rico. If one decides to venture out to explore the area, a rich diversity of cultural offerings including museums, concerts, theaters, and cinemas, among other alternatives await. It should come as no surprise, then, that there have been different initiatives proposed to officially designate Santurce as an arts district. Notwithstanding the aforementioned wide range of artistic and cultural offerings, the first thing that will draw the attention of passersby is the overwhelming variety of public art almost everywhere one looks. Sculptures, murals, and graffiti all rise defiantly in and between common spaces, countering the abandonment and decay to which a good part of what once was one of the most important commercial hubs in Puerto Rico has fallen. Economic activity began to decline in the area with the advent of the first shopping malls during the sixties and seventies. Most people started to prefer to do their shopping in indoor spaces with air conditioning instead of walking in the city. The heart of economic activity moved from Santurce to the Hato Rey area, forcing many small businesses to close. By the eighties and nineties, Santurce had noticeably deteriorated. In recent years there have been some efforts to revive the area, concentrating mostly on the zone near Ponce de León Avenue, one of the main arteries of San Juan. These efforts have assumed various forms, from the development of housing, infrastructure, and commercial projects to various outdoor activities designed to draw large crowds. However, in many cases the actual result has been the displacement of entire communities, giving way to the gentrification of the areas that these efforts seek to positively impact. Partly as a response to this outcome, initiatives have arisen from the artistic community to counteract both the abandonment of Santurce, and the appropriation of the area’s future by interests whose aims may not align with the vision of strengthening the community. 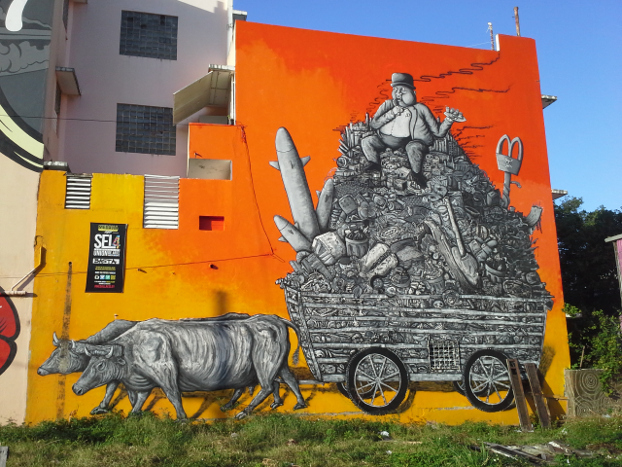 These public art initiatives are key in the efforts to revitalize Santurce. Although these efforts do not necessarily originate within the Santurce community, they do enjoy its support and collaboration. Two of the most salient examples are the urban art festivals Los Muros Hablan (The Walls Speak) and Santurce es Ley (Santurce is Law). Both festivals have managed to create ripples beyond Puerto Rico and are directly responsible for the proliferation of murals in Santurce’s public places. Both festivals feature as their main attraction the creation of murals by local and international artists on the walls of abandoned or deteriorated buildings and also include music, theatrical performances, food kiosks, and in the case of Los Muros Hablan, discussion panels. World-renowned artists have come to create murals for these festivals, leaving their works for all to see on the walls of buildings throughout the area. Santurce es Ley got its start as the idea of artist Alexis Busquet, owner of the gallery Clandestino 787, as his contribution to the revival of Santurce. In 2013 the festival celebrated its fourth edition with great success, incorporating Puerto Rican artists along with artists that hailed from countries such as the United States, the Dominican Republic, Peru, Portugal, and Ukraine. But what is truly genius about Santurce es Ley is that it was held in one of the most ignored streets in all of Santurce, Cerra Street, thus becoming a real force for change in the community. Residents of the area welcomed the festival, inspiring them to continue their efforts to try and improve the neighborhood’s quality of life, which in its heyday occupied a prominent place in Puerto Rico’s music industry as a record production center. Los Muros Hablan is a particularly successful case. Its goal is similar to Santurce es Ley, but differs from it in that there is now an iteration of the festival in El Barrio in New York. The New York version of the festival is organized jointly by La Respuesta (a cultural space on Fernández Juncos Avenue in Santurce where different alternative artistic and indie currents converge) and El Museo del Barrio in New York, with support from the local city government. Like its Puerto Rican counterpart, Los Muros Hablan: New York seeks to unite local and Latin American artists in order to rescue abandoned and deteriorated public spaces. Beyond merely being a festival, Los Muros Hablan is a manifestation of a reality that Puerto Rico is currently undergoing: the massive emigration of Puerto Ricans from the island, particularly to the United States. Emigration waves are nothing new in the nation’s history. At the beginning of the twentieth century there was a massive emigration of Puerto Ricans to Hawaii, and later during the 1970s there was another wave, this time to cities such as New York and Chicago. However, with the amount of people that have been forced to seek better employment opportunities outside of Puerto Rico during the last ten years, it is the first time that the number of Puerto Ricans abroad is greater than the amount of Puerto Ricans living on the island. Puerto Rico tiene un gran déficit de espacios públicos. A falta de opciones recae cada vez más en la propia gente, en los grupos ciudadanos dar respuestas a sus necesidades, crear sus propios lugares. Solo el atreverse a actuar, a reclamar territorios, hará esto posible, solo la solidaridad, la concertación y la acción colectiva permitirán que se sostengan y se mejoren. Ya se ha dicho, las ciudades se hacen de muchas maneras, a veces con, a veces sin permiso, pero siempre con creatividad. Puerto Rico has a great deficit of public spaces. Faced with a lack of options it is up to the people, to citizen groups to respond to their own necessities, create their own spaces. Only in daring to take action, to reclaim territories, will this become possible, only solidarity, common agreements, and collective action will allow communities to sustain themselves and improve. It has already been said, cities are made many different ways, sometimes with, sometimes without permission, but always with creativity. Ángel L. Carrión Maymí: Ángel L. Carrión Maymí es un músico y bloguero puertorriqueño. Ha contribuido varios artículos relacionados a Puerto Rico para Global Voices Online sobre diversos temas, tales como la política, la música, el ambiente, la cultura y los derechos LGBTT, resaltando y contextualizando las conversaciones que ocurren en los medios ciudadanos. Posee un Bachillerato en Música del Conservatorio de Música de Puerto Rico y actualmente es estudiante de Maestría en Historia de Puerto Rico y el Caribe en el Centro de Estudios Avanzados de Puerto Rico y el Caribe. Ángel L. Carrión Maymí is a Puerto Rican musician and blogger. He has contributed several articles related to Puerto Rico for Global Voices Online which cover a wide range of subjects, such as politics, music, the environment, culture, and LGBTT rights, highlighting and contextualizing the conversations that occur in citizen media. He holds a Bachelor’s Degree in Music from the Puerto Rico Conservatory of Music and is currently working on a Master’s Degree in the History of Puerto Rico and the Caribbean at the Centro de Estudios Avanzados de Puerto Rico y el Caribe. Soumission de Houellebecq : ¿Islamófoba, decadente o misógina?